How Far is Vishwas Gowri Espana? 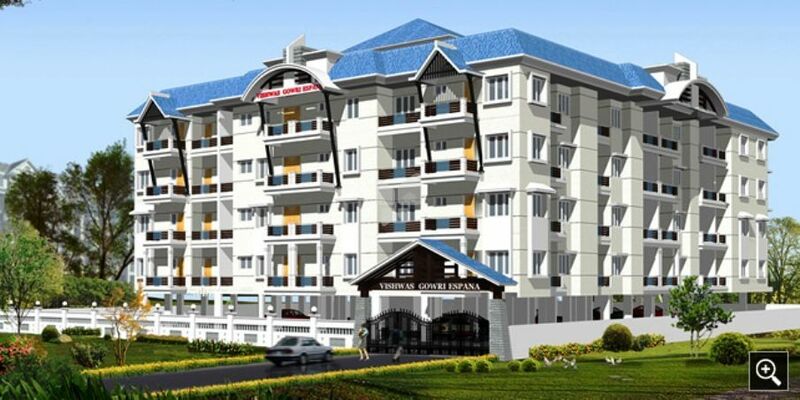 Vishwas Gowri Espana is a residential development of Vishwas Bawa Builders, in Vidyaranyapura, Bangalore North. It is a four storeyed building offering 2BHK apartments having built-up area of 958 square feet each and 3BHK apartments having built-up area of 1200 square feet each. The project is well-equipped with all kinds of modern amenities and basic facilities. Structure: RCC frame work with concrete block masonry walls & Water proof treatment done for sunken RCC slab. Parking: Spacious covered car parks in the stilt and surface car parking in the periphery. Elevator: Two elevators of six passengers. Living & Dining: Vitrified flooring and skirting. Oil bound distemper for ceiling and walls..
Bedrooms: Vitrified flooring and skirting. Oil bound distemper for ceiling and walls. Balconies: Non - skid ceramic flooring and skirting. MS railings. Kitchen: Ceramic flooring and skirting. Granite platform with stainless steel sink. Ceramic tile in platform areas upto 2' 0" height. Bathrooms: Ceramic flooring and wall tiling. Hot & cold mixture unit for all bathrooms. Doors & Windows: Sal wood frame with OST Shutter / Modular shutter for main door. Sal wood frame with flush shutter for Bedrooms, Kitchen, Balcony, Utility & Toilets. High quality aluminium / PVC windows. Common Areas: Spacious lounge with Marble*/Granite* flooring in entrance lobby areas. Security: Security Room and common toilet in the stilt. Telephone: Telephone with Centrex facility (intercom) connection to all apartments with Cable TV connection. power with single phase meter. Power & Water: BESCOM power supply. Standby DG back-up for common area lighting, lifts, pumps and lighting point in each apartment. Automatic water level controllers, Water supply from Corporation and borewel. Trust is the firm belief in the reliability, truth, or ability of someone or something. Trust is the firm foundation to every new beginning. Vishwas Bawa Builders, the promise to honour your trust in us. At the turn of the century, the idyllic coastal town of Mangalore was about to become one of the fastest developing cities in the country. In 2002, under the able guidance of Mr. Abdul Rauf Puthige, a renowned builder and philanthropist, Vishwas Bawa Builders was established with the purpose of building extraordinary real estate properties, which would change the scenario of the building and construction industry. Today, over a decade later, Vishwas Bawa builders have created a legacy for themselves with their state of the art luxury and budget housing in key sectors of Mangalore, Bengaluru and Moodabidri Known for their select “Boutique Apartments”, Vishwas Bawa Builders excels in the creation of architectural designs that are both esthetic and highly functional. Vishwas Builders began as a venture to cater to the growing demand for high end housing in Mangalore, complete with value oriented building solutions. With an overwhelming response from satisfied customers we set to construct state of the art infrastructural complexes in Mangalore, Moodabidri and Bangalore. With 40 completed projects and 18 ongoing projects, we have successfully created a niche for world class residential spaces. Further on, we intend on expanding to high rise residential complexes, group housing societies, retail, commercial, layouts and hospitality spaces.Our core values of commitment, integrity and transparency are reflected in all our ventures, making us one of the most sought after developers in Karnataka. Placing us at the fore of the building industry is our superior technical know-how and state of the art infrastructure. Every project is optimized to make the best use of resources, making it cost-effective and value efficient. As members of CREDAI we are committed to provide quality buildings to our customers in the fastest and most transparent way. 100 highly experienced and passionate experts makes up the team at Vishwas Bawa Builders. The board of directors consist of members who have over 15 years of experience in global real estate development. A diligent workforce has been hand-picked for their vast personal experience and superior knowledge. Each member is committed to provide service based on quality without compromise. Along with quality based services, we also ensure that quality standards are maintained from initial entry level to the final delivery of projects. Only top quality Grade A material is used in all our ventures to ensure the security of not just our customers but our workers and colleagues too. Safety standards are maintained throughout and national building safety rules are adhered to strictly. 42 completed projects by Vishwas Bawa Builders has been critically acclaimed throughout Karnataka. Some of our major projects include Vishwas Kalandan Court, Vishwas Jupiter,Vishwas Sahara Heights at Pandeshwar, Vishwas Garden, Vishwas Jasmine, Vishwas Manor, Vishwas Regency, Vishwas Royal, Vishwas Imperial Vishwas Homes at Falnir, Vishwas Dwaraka, Vishwas Kuteera, Vishwas Sathyam at Mannagudda, ViswasSamrat, Vishwas Ashakiran, Vishwas Anmol at Yeyyady, Vishwas GowriEspana, Bangalore. Two highly awaited upcoming projects are Vishwas Alexander Heights at Pumpwell and Vishwas Carlbenz at Nanthoor. Yet beyond of all these,the project Vishwas Kuteera is only allotted for the vegetarians only. At Vishwas Bawa Builders we have always placed one foot forward to fulfill our social responsibilities. Established in 25th December 2005, The Talent Research Foundation is the brainshild of, Mr. Abdul Rauf Puthige. Back to School campaign, Scholarship drive, Career guidance, Healthcare, Relief to Handicapped, Environment Protection, are just some of the activities undertaken by this organization. Several De addiction and Self Employment camps have been organized to successfully motivate people to become responsible members of society again. Mr. Puthige is an honoured recipient of the Indira Priyadarshini Award, District Rajotsav award in 2016 and Sadbhavana AWARD 2016 from DKSC, KSA, for his outstanding contribution to help uplift the poor and underprivileged. Apart from this , Mr. Abdul Rauf Puthige has visited 72 countries including Rome, Vetican city,Angkurwat Indianized temple complex in Combodia, Jerusalem, America, Mecca. He is interested in researching ancient architecture in various countries. Such accolades bear witness to the trust that has been placed in us by our patrons. This belief is us propels us to move forward everyday towards a better future that is secured by the promise of trust, integrity and loyalty.